The quarterly Village Market ATL invites the community to shop, be entertained, gain knowledge and fellowship. Amixture of art, live performances, plant-based food and a collective of social entrepreneurs of color, the Village Market ATL experience is a unique one. The quarterly family-friendly affair invites the community to shop, be entertained, gain knowledge and fellowship. "I wanted it to feel like one big family reunion/party," says founder and curator Dr. Lakeysha "Key" Hallmon. "There's a lot happening in the space, and I think that's what makes it really special." The concept for the marketplace was born after Hallmon began hosting master classes on business development and financial empowerment under another social enterprise she created, Young, Gifted and Black. The monthly sessions, which she called the Village Market Series, were free and quickly began to expand. "Each month, there would be over 100 attendees in these master classes, and more than 80 percent of them were entrepreneurs or aspiring entrepreneurs," Hallmon recalls. "People were hungry for knowledge on how to build and sustain their businesses, but there wasn't a platform for them to gain the exposure they needed to be successful." Hallmon recognized this as an opportunity to create that platform. So, leveraging the audience she gained through the classes, she began designing the blueprint for an event that the entrepreneurs could graduate to in order to put what they had learned into action. With each event, the Village Market ATL has gained momentum and currently has a waiting list of vendors for its next expo. And to ensure they have a solid showcase, each merchant is thoroughly vetted. Hallmon's team considers the length of time a potential vendor has been in business, payment options available to customers and more. They also have honest conversations with entrepreneurs about what the owner believes is stifling their company's growth. "I really have a very good vision of what I want for our community and black entrepreneurs and entrepreneurs of color," Hallmon says. "I want us to have infrastructure of strong customer service, excellence in quality and sustainability." But of more importance than the goods and/or services a vendor provides is its record of giving back to the community. "You have to be a social entrepreneur," Hallmon says. "You can't just come and make money. That's being short-sighted in terms of what the village needs. I really believe in the model of when you give, you receive and when you receive, you give." And her belief seems to be proving itself true. The events get more than just foot traffic from window shoppers. At the most recent expo in July, more than 1,200 attendees spent a combined total of more than $25,000 with vendors with a portion of that money being redirected back into the community. 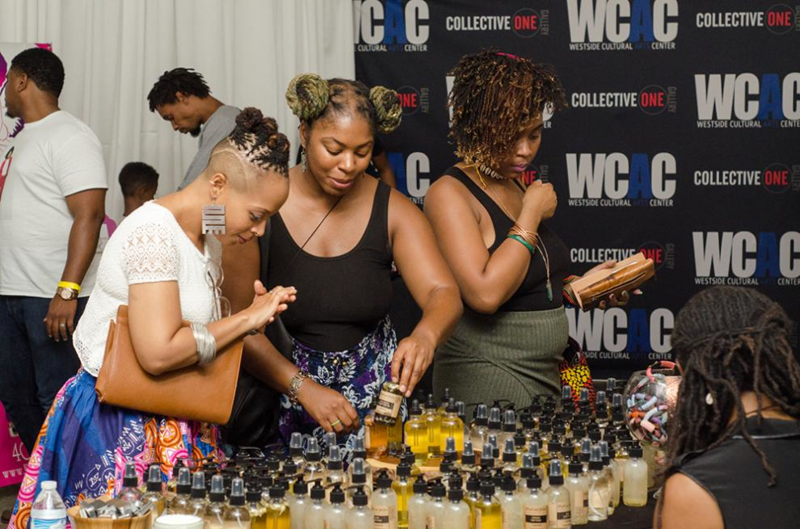 Separate from vendor giving, the Village Market ATL itself applied a large portion of the admission ticket proceeds to We Got Your Back, a grant Hallmon set up to support organizations that focus on creating engaging and progressive opportunities for youth. Plus, a select number of attendees was awarded bundles of empowerment vouchers that could be used for free services, including therapy sessions, gym memberships and plant-based meals. Once well established, the plan is to grow the Village Market beyond Atlanta. "We want to hit the urban cities of the United States and internationally bringing more exposure and consistency to buying in the local community," she says. "The vision is to create a strong skeleton of buying black, buying local and being intentional about our spending, and for entrepreneurs, also being intentional about the product that they're selling." Despite the various expos, festivals, entertainment and pop-up events that are a part of Atlanta's consumer landscape, it hasn't given rise to a sense of competitiveness in Hallmon. "I understand that this is Atlanta and everything is showy. There's a place for showy, and there's a community for it. I'm OK with that. It's just not my area," she says with a smile. "If Beyonc̩ is coming to town, it's showy, and I'm going. But, the Village Market is truly like a family reunion with people you don't know, and I want us to know what it feels like to come together again." The Black Friday edition of the Village Market ATL takes place Nov. 24-25 at the Georgia Freight Depot, 65 Martin Luther King Jr. Drive S.W. For more details and to purchase tickets, visit www.thevillagemarketatl.com.